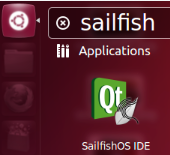 The Sailfish OS is a mobile-optimized operating system (Linux core) with an Qt Platform. Oracle’s VirtualBox version 4.1.18 or higher pre-installed on the host machine. You should install the VirtualBox supplied by your distribution.